WTC 7 Final Report — Coming in August! Today we are thrilled to announce that the final report of the WTC 7 computer modeling study, which is being conducted by Dr. Leroy Hulsey at the University of Alaska Fairbanks (UAF), is set to be released in August of this year, shortly before the September 11th anniversary. This report will be the culmination of more than two years of intensive modeling of WTC 7’s complex structural system, leading to an unbiased and transparent evaluation of whether fire or any other natural scenario could have caused the total, near-symmetrical, free-fall destruction of the building, as witnessed on 9/11. Unlike the studies conducted by the National Institute of Standards and Technology (NIST) and by firms working on behalf of Silverstein Properties and Con Edison, all of the data associated with the UAF study will be made public so that it can fully be scrutinized. Earlier this year, Dr. Hulsey and his team entered the final stage of their research, in which they are analyzing the structural response of the building to the failure of one or more columns and determining the kind of failures needed to reproduce the observed structural behavior. Before this stage, the team was evaluating the effects of fire on the structural members of Floor 13 near Column 79, where the collapse of WTC 7 is alleged to have initiated. The results of that analysis led Dr. Hulsey’s team to conclude in no uncertain terms that fires could not have triggered a global progressive collapse. 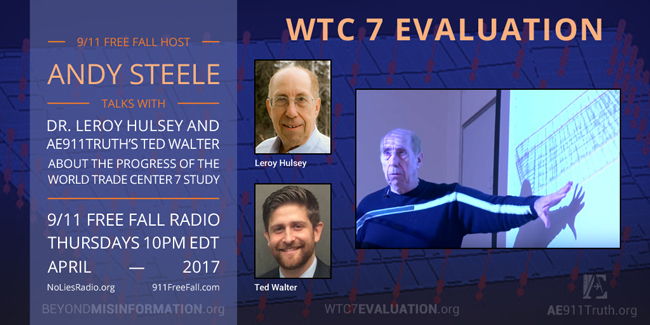 For a full status update, we invite you to listen to Dr. Hulsey and AE911Truth’s Ted Walter discuss the project on yesterday’s episode of 9/11 Free Fall. We hope you’ll be ready to help AE911Truth raise awareness of this groundbreaking study when the final report is published in August. A deep, heartfelt thank you to all those who have contributed thus far to making this project possible.